Happy Friday everyone! Just wanted to let you know that a new challenge starts today at Caardvarks. The challenge is to color a stamped image. You can use any method you want...markers, colored pencils, paint, etc. The sponsor is My Scrapbook Nook and the prize is 4 Copic markers. 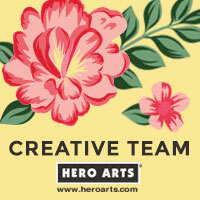 Here's a card I made where I colored this awesome flower stamp from Hero Arts with colored pencils. Then I outlined it with glitter glue to add a little sparkle. Hope you have time to play along! Have a great weekend! LOVE the color combination! beautiful card!! I love this card you made for the Caardvarks challenge, Kelly! All the coloring, glitter and stitching are truly awesome! Super pretty colors on this card Kelly! So lovely, wishing you a beautiful Thanksgiving celebration with your family!